Sprinkle 2 tablespoons grated sharp cheddar cheese across the middle of the dough (see below); fold the bottom third of the dough over the cheese, then sprinkle another 2 tablespoons cheddar over the folded part. Fold the top third of the dough over the cheese. 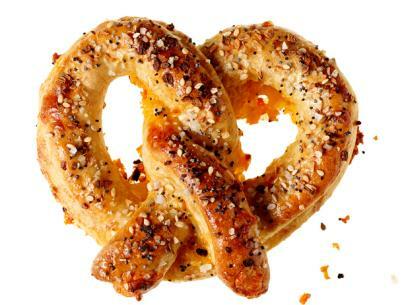 Reroll, cut into strips and twist into pretzels. Brush with beaten egg and sprinkle with poppy seeds, sesame seeds, onion flakes and kosher salt; bake.